I'm not going to go into the full story - we here at OAFE love Bionicle, we love the Toa and we love Lego for bringing us all the goodies. We've already prepared an excellent look at the new direction of the line, the awesome Toa Metru, so I'm going to jump right into the review! Toa of fire and guardian of Ta-Metru, Vakama was once one of the city's top mask-maskers. 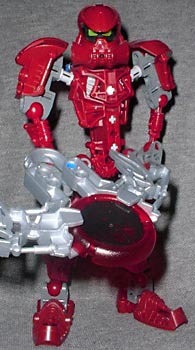 Now he has become a Toa Metru, but he is not always certain he is ready for the role of hero. At times he misses his old life in the foundries, crafting masks for others to wear. Vakama has always been plagued by strange visions of the future. Often their meaning is not clear, and it is a "talent" he has always hidden from others. It is only later that he will discover that those visions are key to saving the city. He has the wisdom and the courage to be a leader, but is not sure he wants that role. My personal favourite from the new series has to be Toa Vakama, the Toa Metru red and the leader of the group. Standing taller than all of his previous Toa brethren, Toa Vakama is a huge 7 1/2" tall, complete with 13 places of articulation. That's right, the Toa Metru are more articulated than ever before, with balljointed neck, elbows, wrists, legs, knees and feet, as well as the gear-driven shoulders. The new articulation works well, giving Toa Vakama more movement than ever before. Accessory-wise, Toa Vakama comes with his very own personalized weapon, different from the rest of the crowd and the older Red Toa: the nifty disc-crossbow. Simply load the pretty translucent red disc into the crossbow, then squeeze it to fire it at an enemy. It's effective, cool-looking and not at all dangerous for the kiddies. I truly doubt this could cause serious damage to anyone except Rahkshi, so you don't really have to worry about firing this at others. It also fits onto Toa Vakama's back like fiery angel wings, for very cool effect - with the disc in place, it looks like he's got a great red halo, truly an angelic hero. Toa Vakama also includes his mask, the Kanohi Huna, the "Great Mask of Concealment". It apparently allows him to turn invisible, but still casts a shadow. Cool! The Toa Metru aren't reliant on the mask collecting as a gimmick this time - all the Toa Metru only have one mask - but they're all specific and very cool, like this one, which looks like a hockey mask/breathing apparatus combination. Very nice. Each of the Toa Metru also comes with its own awesome cd-rom - just put it into your cd-rom drive on the PC and go off on your own little Metru Nui adventure! I really like how the mini-cds give not only a backstory to the Toa and current storyline, but also include small minigames and a feeling of interactivity, making the toys all the more fun. The bio it presents isn't as detailed as, say, this, but I like that - there's still plenty of room for imagination within these new Bionicle characters. 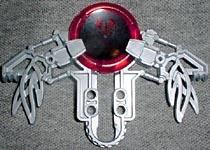 The mini-cds are new to me, never been seen in Australian Bionicle sets before, although I know you Yankees have been getting them with Toa since the beginning. Also, the narrator's voice turns me on. I feel tingly every time he accents Toa Va-KA-ma! Toa Vakama is an excellent toy in an excellent line. The whole Toa Metru line is a nice development for the Bionicle line; the figures are a departure from the organic/mechanical appearance of the past Toa, leaning toward a unique mechanical-guardian look. The new size is perfect, not quite as tall as the monstrous Rahkshi but ideal as the next (or past) evolution. Finally, the storyline also offers a new direction and I look forward to seeing more about it in the upcoming movie Bionicle 2: Darkies Ahoy! What are you waiting for? Go buy now!! Have you ever checked out one of those little CDs? Tell us on our message board, the Loafing Lounge.